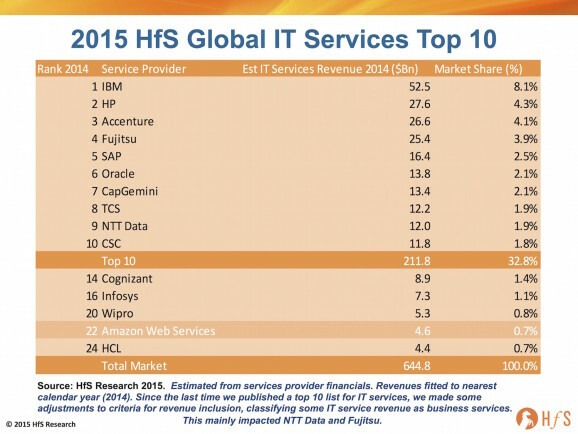 The 2015 HfS Global IT Services Top Ten. Here it is. Last year, we observed the entrance of the first of the large India-heritage service providers into the Top 10 IT Services providers, with TCS entering the fray. Throughout the past decade, the five major India-heritage offshore-centric IT services providers have dominated growth in the marketplace, and had created a new market segment - a tier of fast growing services providers. Over the last 5 years, we have seen another unique growth phenomenon emerge, representing another tier of the IT services market, a tier of even faster growth the cloud pure play providers. In this year’s 2015 list, we have included the Top 10 providers, the major 5 India-heritage offshore-centric providers and Amazon Web Services (AWS), as the largest as-a-service IT services provider (see above). AWS has dominated the infrastructure cloud market with revenues as much as ten times larger than its nearest pure play public cloud providers, at over $4.6 billion. 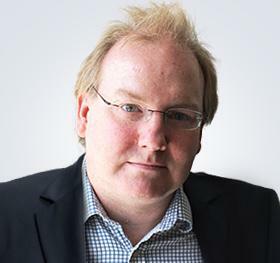 In response to this threat, the traditional providers are also staking a major claim to be in the As-a-Service business with IBM, for example, stating it now has achieved cloud revenues of $7 billion in 2014, with $3 billion of which is As-a-Service, with the rest presumably comprising more traditional consulting and integration services. IBM remains the lead provider thanks to its broad portfolio of technology products and services, plus its genuine global reach. IBM is one of the few providers with significant revenues in professional services, outsourcing/managed infrastructure services, application services and traditional support services. Although HP remains in the number 2 spot, consistently poor growth performances in its Enterprise Services group, over the past 3 years, creates the possibility of being overtaken by Accenture in the near-to-medium term. Fujitsu has slipped down the list, in part due to exchange rate, with ~60% of its services revenues coming from Japan and over-exposure to the recent weakness of the Yen. Of the traditional onshore-centric service providers, Accenture has created a tier in its own right for the last 2-3 years, with a couple of exceptions, posting consistently strong growth quarter by quarter. A large part of this success has been its dual role as a strategic thought leader for its clients, in addition to its focus on delivering global services across an expanding array of global delivery centers, most notably in India and the Philippines. Accenture’s focus on balancing consulting with managed services has helped support the firm’s differentiation and revenue growth in the industry. In addition, its early wins in the digital space that brought about new investments in technology could lead to significant new business value and wealth being created for the firm. SAP and Oracle both have large professional services teams, accounting for ~$3.7 billion in revenue, for both providers. However, HfS includes their product support revenues in its IT services definition that pushes both providers' IT services revenues to the level above. The last 12 months have been good for Capgemini, has managing to remain robust with solid organic growth across its regions, particularly in North America, Asia, and the UK. Its continued focus on portfolio management, taking the best ideas from its large teams of local consultants and building global repeatable business seems, to be working and helping it to grow against the tide in the difficult continental European markets. Its acquisition of IGATE adds some much-needed capabilities and scale in Indian IT services delivery, particularly in financial services markets. TCS stellar growth trajectory has continued at a 15% clip, rising to the number 8 position. Despite being the largest of the India-heritage providers, TCS has continued to grow its IT services business at a pace that belies its massive scale. TCS’ strategy has very effectively broadened its service portfolio, providing customers with a comprehensive set of services in all the markets it plays and has been effective at adapting its services to the idiosyncrasies of local markets, particularly in Europe. In addition, TCS’ focus on organic growth seems to have served the firm well, while most of its India-heritage competitors are more focused on acquisitions. The changes in market share over the last year show that even as economic conditions improve, the IT services providers cannot expect an instant return to strong growth without major investments into their delivery organizations. Plus, in spite of solid performances of the India-heritage providers, there already appears to be another stalking horse approaching the market in the shape of the “As-a-Service” providers. While offshore labor arbitrage has been the catalyst for increased revenue growth over the last two decades, the shift to less labor-centric As-a-Service offerings that are more dependent on automated technology platforms and more specialized skill sets, is starting to alter that dynamic. Despite these secular challenges, we don’t expect the traditional IT outsourcing market to disappear in the short term. One of the criticisms we hear most often about cloud services is the lack of end-to-end support and good quality holistic services. If anything, we expect services to both scale down to meet cloud based services and to add better servicing and scale into traditional style managed services deals. However, the shape of the prime outsourcing contractor agreement is likely to change – with an increasing emphasis on the technology partners and cloud services providers engaged to bring the infrastructure offering together and, increasingly, a more diverse set of application services companies delivering turnkey and custom applications. Moreover, capabilities around robotic automation, analytics, cognitive computing and self-learning are gradually coming to the fore, with many enterprises more willing to make investments in technology-driven As-a-Service outcomes than merely labor savings based on offshore delivery. However, the end of 2015 and 2016 will mark another critical moment in IT services market, with questions about what will become of the traditional enterprise infrastructure outsourcing market as AWS makes huge disruptions to the legacy model, with its cloud based As-a-Service model. These changes will be particularly important for services providers that have struggled to adapt to the new market conditions – HP and CSC are two of the traditional providers we will watch with particular interest as they continue their annual ballet to survive and continue their growth path. Not long after the initial impact of the offshore providers, a new wave of disruption is beginning to have an effect on the IT services leadership. Indeed, we expect the pure-play As-a-Service providers to target positions in this top 10 list, particularly AWS. We see the most exciting developments happening with these providers. If AWS maintains its current growth rate, it could be in contention of a Top 10 space by 2016 and likely to have one in 2017. This is a big if, as it would need to maintain its 50% growth rate, but certainly not impossible in these fast-paced times. We could see TCS joined in the top 10 by another offshore provider, Cognizant as early as the 2016 Top 10, although looking at its results so far, this seems unlikely. Particularly, given the Atos acquisition of Xerox US IT outsourcing business and the expected $2 billion boost in its revenue (currently they are $10.5 billion at number 11), and it is doubtful whether Cognizant will hit the $12 billion market in IT services to catch them or NTT Data, although this may happen in 2016. We may see this delayed or overtaken by the inclusion of AWS. Everyone is talking about the two-tier nature of the IT services market at the moment – largely dividing the market between traditional services markets like IT outsourcing and new solution based services around the adoption of digital technologies (social, mobility, analytics and cloud). With flat or declining market growth in the traditional services businesses and double digital growth in the emerging digital space, it is no wonder why most of today’s service providers are pushing some form of Digital in their service portfolios. However, the competitive landscape is increasingly multi-tiered and you could argue it is currently divided in to three groups: traditional technology services companies, India-heritage providers and now the pure play As- a-Service providers. What is also worth noting is the renewed buying up of niche talent by the leading IT services providers in the high-growth SaaS markets such as Salesforce, Workday and SAP Successfactors. Over time, we expect the first two categories to merge and the distinction between these groups moving away from location or offshore, but to the success of bringing digital to life – and enabling digital for enterprises (not just selling basic IT services to implement apps). By that, we mean demonstrating that they can utilize technology within their client’s business to generate business value. We expect some of the offshore providers to transition more permanently into the slower growing group – we have seen temporary examples of this already with both Wipro and Infosys flirting with lower growth over the past 2 years. We will also see higher growth emerge from some of the traditional providers as they shed more of their legacy business, but retain the higher value work and build on the thought leadership they have created around digital. The addition of providers like AWS into the mix will further commodify the infrastructure management business, however, as mentioned above this will not mean an end to managed services. It just will change what the outsourcing providers manage – they will not be managing as much of the physical technology directly. The role will be more virtual managed service, orchestrating and managing a big catalog of services delivered, in some cases by themselves, but increasingly by an ecosystem of partners. Many of these partners will be this new tier of provider, the pure play As-a-Service companies. HfS subscribers can download the HfS Global IT Services Top 10 report here.